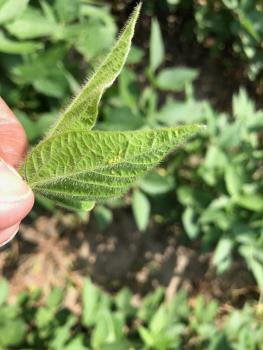 Gray leaf spot, spotting of soybean aphids, and off-target herbicide movement seem to be common and big issues that Iowa State University Extension and Outreach field agronomists saw across the state this past week. Read on for more information about your region’s crop progress and field conditions. Paul Kassel (Region 2): “Crop development has progressed very well recently, but corn development varies a great deal. Corn fields that were planted in early May on pattern tiled fields are in the blister stage/early milk stage (R2 to R3). Corn fields that were planted in late May on fields that were less well drained are just beginning the pollination process. Many of these later planted fields have severely stunted areas as a result of waterlogged conditions in late June. The soybean crop is developing at a similar rate. The early planted soybean crop is approaching the R4 (full pod). Farmers are considering fungicide application on some of the better looking fields – which is a difficult decision with the current commodity prices. Soybean aphids have been at very low levels; however, farmers are concerned that the soybean aphid populations will develop with the onset of the predicted cooler weather." Soybean aphids appeared in this Buena Vista County field this week. Take time to scout for aphids in your fields. Photo by Paul Kassel. 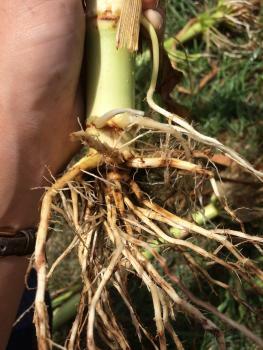 Rootworm feeding found on some corn roots from a field with a suspected Bt trait failure in Central Iowa. Photo by Meaghan Anderson. Adult western corn rootworm found in a corn field in Central Iowa. 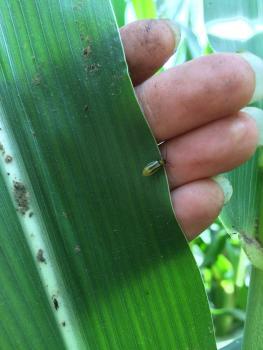 Western corn rootworms are yellow with a dark head. The females have three black lines on the forewings that do not extend to the wing tip while the forewings of the males often look like a black smudge. Photo by Meaghan Anderson. 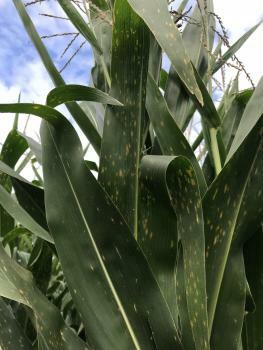 Gray leaf spot has moved into the upper canopy in some corn fields in Southeast Iowa. Photo by Rebecca Vittetoe. 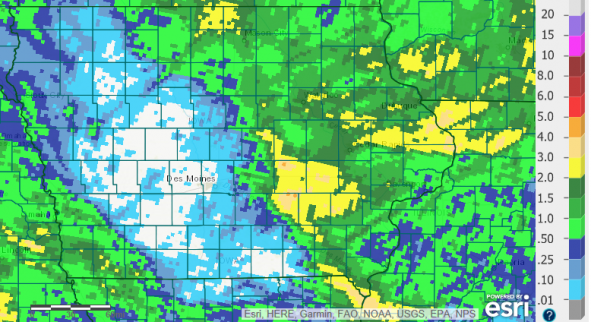 Rainfall totals across the state of Iowa for the past 7 days as of July 23, 2018. Source: http://www.weather.gov. 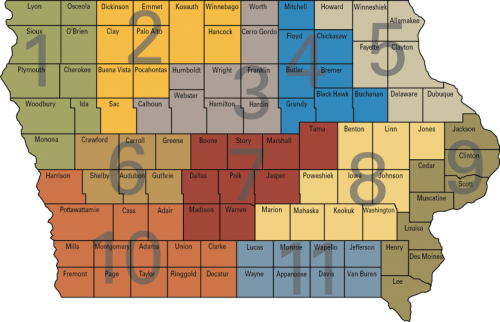 Check out the map below to find your local ISU Extension and Outreach field agronomist and find their contact information here! Map showing the regions and counties field agronomists cover.